WGSL is one of more than 5,000 organizations on LibraryThing. WGSL is listed as a "fiber arts guild." About meThe Weavers' Guild of St. Louis is a non-profit group of contemporary textile artists and the second oldest guild in the United States. Our membership is a varied group of people from novice weaver to professional production weaver. See the web site for more information about meetings and workshops. About my libraryThe WGSL library is maintained for the use of Guild members, and is a benefit of membership. It is currently located in the home of the librarian. Members may visit the library at regularly scheduled times, or by appointment with the librarian. 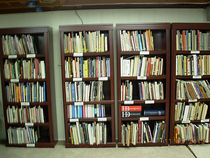 Members may borrow up to 3 books or other items at one time, and they may request that the librarian bring a specific book to the next meeting to be borrowed.